i’ve reached a place now. i’ve reached the place, i think i could say. the timing seems all wrong. but words have come alive in my soul again. and that’s something I've struggled to do for months and months. i think i’m discerning through the doubts. there will always be reasons not to act. there will always be more information i can get before i decide to act. there can always be alternative options. but everything that we do in life requires sacrifice of one type or another. even though some sacrifices may seem bigger than others, they’re all still choices made at the cost of making other choices. when we think that we are staying safe, comfortable, or happy because we are choosing to not make certain hard, sacrificial choices. it’s those times that we are blind: we don’t see that our refusal to make these hard choices is making our life harder in other ways. passivity and lack of commitment is costing us time — time in which we could be making progress (whether personal, tangible, or other). safety often is costing us the unknown — a place where we will find things around the corner that we didn’t even know were there because we refused to step out. fear of failure is costing us times when we learn to fly (or time when we learn to fall into His grace). both are good. both are necessary. one of the biggest sacrifices is when we "refuse" to sacrifice. He’ll speak to your heart about sacrifices.. if you are willing to listen. He is faithful to lead and to guide into sacrifices.. if you open your heart to Him and let Him bring you to a point where you are ready. and the world is hurting. 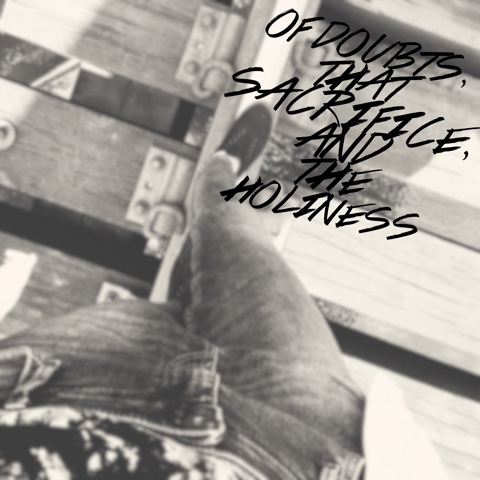 who are we to refuse to sacrifice as we give in to our petty doubts? what would it look like if we stepped past the doubts and kept our eyes on the magnificent power of our King? well, i say let’s go find out.